First of all: Being at home with a sick kid is soooo boring. We are dealing with a stomach bug in our home and nobody is really interested in the Halloween decorations and candy (obviously). This was just the same on Valentine's Day, when I had helium balloons and made heart shaped muffins and Big L was throwing up the whole day. Good times. Also, I am mad as hell as I was responsible for opening the store today and with sick kids this is somewhat difficult. But the company was not able to organize someone to cover my shift. Big bummer. I then found a way but it was not the best solution for me or the kids. The next time that damn store is staying closed. So what. Not my problem, right? And then I realized, that there probably won't be a next time. I am going back to teaching in one month from today. Wohoo! I am so looking forward to it! Now, at dinner time Little L is much better and chewing on some corn chips and sipping caffeine free coke. I'd say the worst is over. Let's hope for the first night with no throwing up and a good night's sleep. Nothing stresses me more out than kids with a stomach bug. Here is the newest edition of My Style with items I love and wear/use this fall. I hope you like it. How was your weekend? Ours was really good, the right mixture of getting stuff done and laid back. I started reading the first Christmas romance, which turned out to be more chick-lit. But that goes pretty well with my anglophile self. I hope the review will be up by November, 1st. We also cleaned out the bedroom, which was our room for hoarding all kinds of stuff. now it is neat and clean and I love it. We visited church for the final service of kids week, which was just wonderful. It really touches my heart to see hundred children worship and praise the lord. And as every year, I think we have to go to church more often. Let's see how that works out. We are heading into this very busy week today, which kind of stresses me out before it already begun. I have to work a lot and mostly long shifts, which means Big L will be home alone when he comes from school. It usually is not a problem, but I would like to be there to welcome him home. To make lunch and talk about what happened in school and how his day went. Plus, we have different appointments this week, at the pediatrician with Little L for his annual check up. At the dentist, all three of us for check ups and I lost a filling. Good times. Then there is Little L's swimming class today and I have to work a long shift on Saturday. It's a six-days-week and full of things to do. I cannot wait for Sunday! This will be much better comes December, 1st. Maybe you heard the news before, maybe not, but I will go back into teaching then. I will work three days a week and be always home when the kids return from school or daycare. I will be off on Mondays and Fridays, which means a four-days-weekend and three days of work. And I am getting lots of money for that, too. I am so looking forward to it! we are in the middle of October, which means I am getting ready to start the Christmas Reading Challenge on November, 1st. It's pretty simple: I read as many Chrismas romance as possible within two months and blog about it right here. This blog is being active only during that period of time and everybody is invited to join me. This year, I am looking for readers, who'd like to write reviews about their favorite Christmas book, preferably romance. So, if you like reading and you are into Christmas, please feel free to email me or contact me vie facebook messenger in case you wanna help me out. Everybody is invited! Also, I am still looking for book suggestions, so you can leave your favorite Christmas reads in the comments. Thanks a lot and happy reading! Congrats! Please email me you adress (or send me a PN via Instagram) and I'll ship the lovely stuff as soon as possible. I have a great suggestion for you, in case you like seasonal reading and anthologies. I only bought this book, because one of the stories is by Kate Angell, my all time favorite romance author. While reading, I realized that it is not only romance, but totally fits my enthusiasm for reading stuff that fits into the season. During summer break, I read books which take place on the beach. During winter, I read Christmas romance. A Halloween book was something, I really needed right now. Well, there you are. 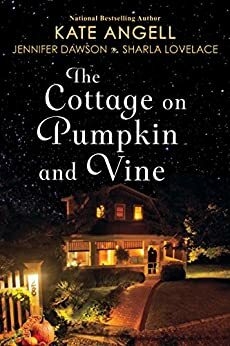 The Cottage on Pumpkin and Vine is set in Moonbright, Maine on Halloween Eve. In the town's little B&B, there is the annual Halloween party taken place, which is said to make wishes come true on this one night only. This year, it happens to be full moon as well. For three couples it will be a night to remember. A night full of spooky creatures, black cats, tarot cards and candy corn kisses. As always, I just love Kate Angell's writing. Fast-paced, funny and greatly developed characters. She often writes short stories for anthologies, and sometimes, I am really disappointed by the other writers and/or their stories. This is not true for this book. Although you can tell by the writing, that three different authors wrote the stories, they are cleverly adjusted to make it a series of stories in the same setting. I read all three stories with pleasure. Really, you should read it. Right now. Cause Halloween is around the corner and this anthology will make you want to celebrate. Happy Reading! P.S. Please remember to enter the giveaway! Only two more days! Go right here. Oh, what a lovely week we are having so far! We are in the middle of fall break and we are enjoying ourselves a lot. We started with a trip to Ikea and the living room make over. 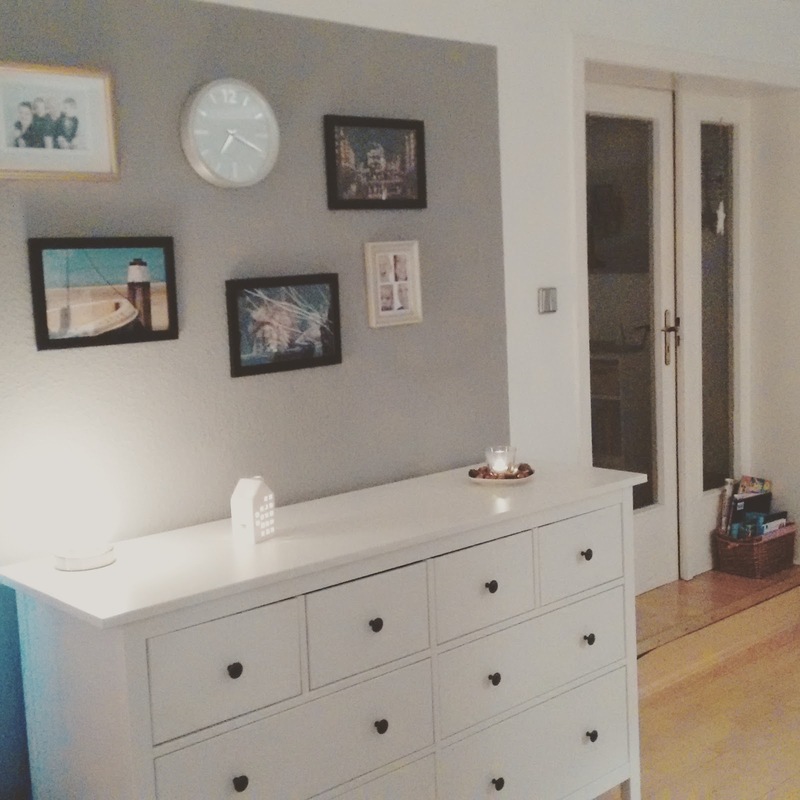 We got rid of all our dark brown furniture and replaced it with white, which is just so lovely. Look. Then we spend some time at home to relax, read, watch a movie. We had my parents over for coffee and I made a NY cheesecake, which was so yummie. Today we went out for breakfast to a lovely café with family. Now, DH and Big L are sorting throught his millions of Playmobil pieces to sell them at ebay before Christmas. It really is a great task. Not! You can buy stuff from all over the world, shipping is world wide. For questions, just write a private message. Also, don't forget to enter the giveaway (click)! I am shipping this stuff to wherever you are! It's free, so join! how was your week? Mine was chaotic and hectic and ended with a trip to Ikea and the living room make-over. But I am so happy about the outcome. I will post about this later. Today, I got something for you! To celebrate the comeback of MisbehavinAngel, I am giving away some cute things for us ladies. 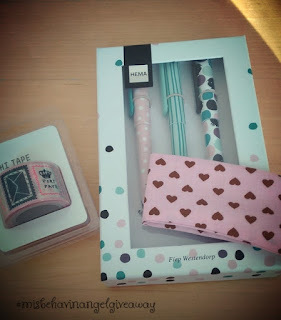 It's a set of pens in pink, white and mint and a lovely washi tape. 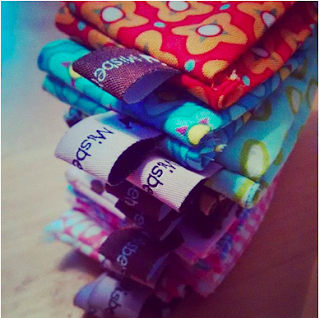 Plus, you will receive one item from my shop, a lovely coffee wrap for your coffee-to-go cup. You will never again burn your finger tips. You're in? Leave a comment under this post. Share this post via facebook or twitter and/or link me on your blog. That's all. Invite your friends to play. The more, the merrier! The giveaway will end next Sunday (October, 16th) midnight, European time. 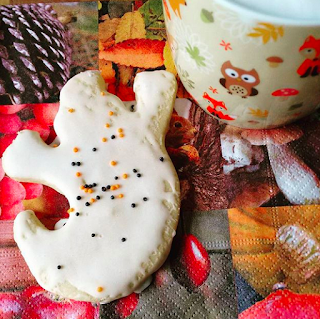 I promised to blog my favorite cookie recipe for Halloween and here it is. For the dough, mix the margarine with the egg yolk. Add flour and 100 gr of the confectioner's sugar. Beat at high speed until you have a soft, but solid dough emerges. Roll and use cookie cutters to cut out Halloween shapes. I use these (click). They are of a great quality, dish washer proof and easy to handle for kids. Plus, the price is just amazing. Bake at 180° Celsius until the cookies are light brown but still a bit soft. They will get crisp while cooling down. If you bake them too long, they will be dry and nobody wants a dry cookie, right? 1 beaten egg white, 150 gr confectioner's sugar and a tiny little bit of milk until the mixture is smooth and good to frost. I also add some sprinkles in black and orange for the Halloween feeling. Done. Now go and prepare some nice coffee or hot chocolate and have a bite. Happy Halloween month! ... everything is just fine. We used the long weekend for a visit at the zoo, a day in the woods and also some good old nap time. It was the perfect mixture of action and laid back. I also squeezed in some time to sew and get stuff done for the shop. And I shopped like mad at the fabric market. 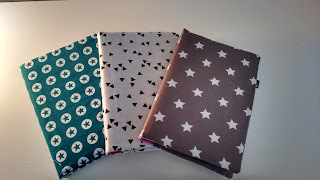 I found cute new fabrics for Little L and nice stuff for the 2017 calenders I wanna make. We hardly saw Big L (my big boy) over the weekend. He had a sleep over at his friend's house on Saturday and on Sunday that friend stayed overnight with us. It was fun for them, but now that it's Monday evening, he is sooooo tired. I predict he will fall asleep early today. I am looking forward to these next days as I am off until Thursday, when I have to work a short shift. 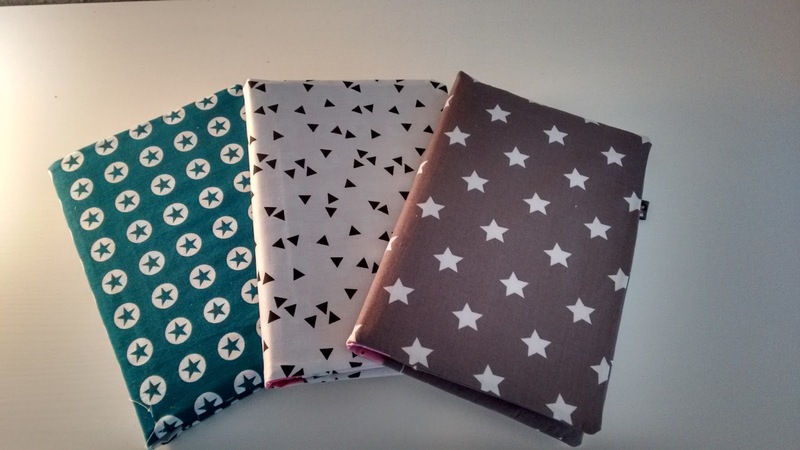 I am planning on getting more sewing done and hopefully will be able to upload the new stuff to the shop as soon as we have figured out the problems with my phone. That is SO annoying. More for DH though, who is dealing with it. I also wanna blog my favorite cookie cut outs recipe for you, so that you can do Halloween cookies soon. Ours are all left by now, which is amazing as we made them three days ago and it was some dozens. They are that good, ya know. So, have a good start into the (short) week. For us, it's the last week before fall break. I am so looking forward to that.